Once you enter the realm of fragrance love and develop a perfume collection worth talking about, you will undoubtedly discover that full bottles are no longer practical. For one, if you like to travel, they are cumbersome to pack into a suitcase and heaven forbid they break in transit. Second, it may not be humanly possible to single-handedly utilize all the juice you have collected. Therefore, decanting some of your favorite fragrances into smaller containers, for yourself or to share with a friend becomes a fantastic idea! In addition, you can purchase smaller amounts of fragrances you like from several e-tailers who specialize in decanting from their fantastic collections. I highly recommend doing both. First of all, let us discuss your own collection. I have found this website to be a fantastic resource for all decanting supplies. Their inventory changes frequently and the supplies they send to you will make any virgin decanter more comfortable! I also purchased my own label maker for my decants to speed up the process of identifying each fragrance. They also look much better with a professional label but it is certainly not necessary. A handwritten label will do but definitely make sure you do not forget to label. I think most of us have experienced the frustration of spraying an unidentifiable fragrance. 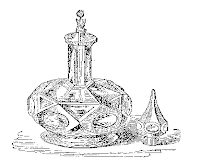 Now, for purchasing decants, this link from our friends at Perfume Posse offers an exhaustive list of decant e-tailers. I personally have had excellent experiences with Fragrant Fripperies, Bois*Bois, Dragonfly00 and Fishbone96. In addition, I am considering creating my own decanting website since my collection has now grown out of control. Decanting provides a convenient, hassle free and cost-effective avenue for collecting and traveling with your favorite fragrances. If you have not ventured into the world of decants, try it. You might like it! Great to see you. I understand crazy weeks, that's for sure. Thanks for stopping by and I'll talk to you again soon! Decanting looks fun with all that paraphernalia, now that I know where to get them! Gosh, it's making me want to buy more perfumes so I can decant them... Thanks for the super useful posting, as usual. Have a great weekend! You're willing to share your Tubereuse Criminelle? Wonderful collection! As you might know, I live in earthquake country, so I keep my bottles in their boxes on the bottom shelf of the linen closet and decant into 5ml bottles that I keep on the dressers. It's great for three reasons: the bottles aren't subjected to temp and light, the bottles never get any possible contamination from skin contact, and as you pointed out, if you are going away for the weekend or even a day you can grab a decant and go. Now THAT is ingenius!! What a fantastic idea to decant all of your full bottles to have them handy. And yes, I'm willing to share Tubey Crim. I just can't wear it, unfortunately.